Tires are one of a vehicle’s most important components because of the oversize role they play in affecting ride, handling, stopping distance, fuel mileage and safety. They are literally where the rubber meets the road. That’s why it’s important to recognize when it’s time for new tires by following these tips. As tires wear, the tread depth becomes shallower, and the grip your tires can deliver – particularly in snow and rain – decreases too. New tires last 30,000 to 50,000 miles if cared for properly. Some all-season tires can last longer. A quick look tells whether tires are nearing the end of their life. Examine the tread depth to see how deep it is. At the same time, look for raised bars that run perpendicular across the tire tread. The bars are wear indicators, and the closer they get to being level with the surface of the tread (2/32â€ of tread remaining), the sooner you’re going to need new tires. It’s recommended that tires be replaced before or when the tread depth is down to 2/32â€, as compared to an 11/32â€ depth when new. A tire tread depth gauge will provide that answer, or you can use the old “penny trick.â€ Insert a penny, with Lincoln’s head facing down, into the tread. If all of Lincoln’s head is visible, your tires have less than 2/32â€ of tread depth and need to be replaced. Tread depth should wear evenly across the tread and at the same rate on all four tires. However, a variety of factors can cause tires to wear unevenly, which is why they need to be rotated every 6,000 to 8,000 miles to help even out that wear. Look for signs of uneven wear, particularly on the outer edges of the tire’s tread where it often appears first. If the uneven wear can’t be stopped through rotation or fixing what’s causing the wear, the tire(s) may need to be replaced as the tread depth in the problem area becomes too shallow. Tires typically wear out before they “age out,â€ but on some vehicles, such as a trailer or car that’s used infrequently, the tires may need to be replaced simply because they’re too old. 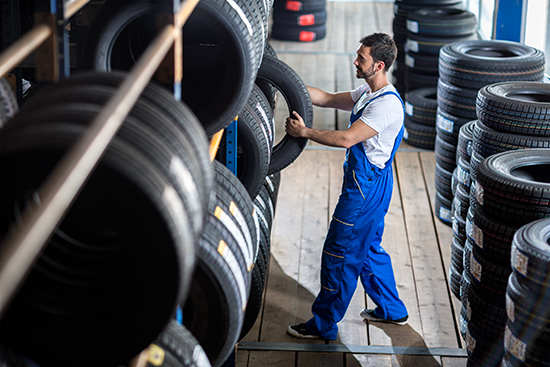 Depending on whom you ask, tires should be replaced six to ten years after their manufacture date. That’s because the chemical components in the tires begin to break down, subjecting them to potential dry rot and failure. Determine tire age by looking on the sidewall for a code that begins with DOT (U.S. Department of Transportation). The last four numbers indicate the week and year of manufacture – 2116 indicates the tire was made in the 21st week of 2016. When it is time for new tires, it’s recommended to replace all four at the same time. On all-wheel drive vehicles, it’s practically mandatory. Here’s why: as tread wears away, the tire’s circumference changes too. On an all-wheel drive vehicle, if you replace just one tire, that new tire’s circumference will be different from the other tires, and that can wreak havoc on drivetrain components, damaging the transmission and/or CV (constant velocity) joints. And on any type of vehicle, if you replace only the front tires but still have worn rear tires, the odds of experiencing a spin increase – particularly in bad weather – because the rear tires may lose contact with the road. Take care of your tires – and your passengers’ safety – by inspecting tire tread depth and wear pattern at every oil change, and by checking tire pressure at least monthly.